The same White Pines from the previous post. usually sits on the cement pedestal just left of center — about 2 1/2 feet off the ground. The same White Birch from the previous post. The same Rhododendrons from the previous post. But before we get into the white stuff, let’s have a brief geography lesson. In a previous post, I’ve explained that Long Island looks like a fish. Suffolk County is essentially the body and tail of the fish, jutting out into the Atlantic Ocean. Very often during these winter storms, Long Island becomes the battle zone between rain, sleet, ice, and snow. The same Arborvitae from the previous post. These shrubs took the worst of it. This storm was no exception. Early on, there was rain and sleet — but as the day and evening progressed, the moisture became colder and denser, clinging to branches and trees, all of which achingly bent under the weight. 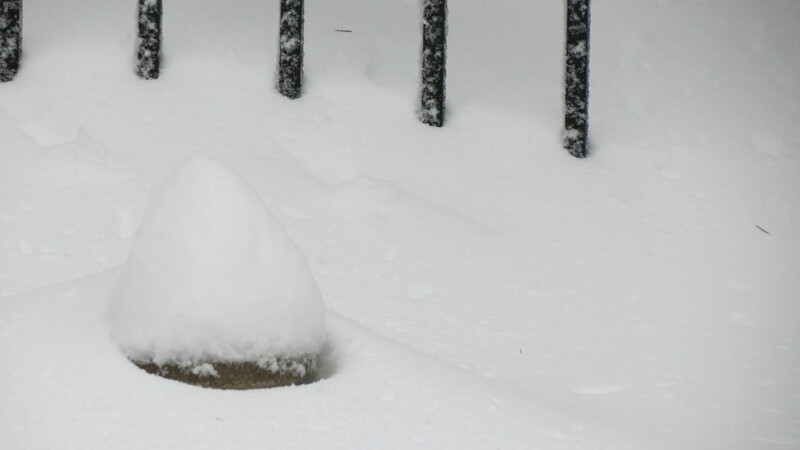 Then the snow arrived, falling at a rate of 3” – 5” per hour –a snow surge if you will. As far as New York State was concerned, Suffolk County — specifically my local area — became snow central, with a 30” accumulation. 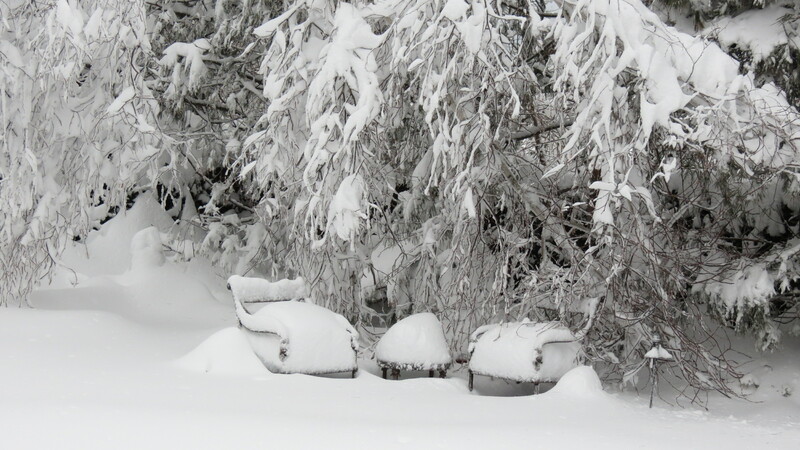 In a matter of hours, a snow deficit turned into a snow surplus. which I planted for winter interest. Interesting, huh? At first light, I looked from the windows and saw what could have been the remains of a foam party, something better suited for a college rave. Even the trees and shrubs looked as if they were suffering from a hangover. Pee Gee Hydrangea had one flake too many. As the scope of the scene opened up, it seemed as if Joe and I were looking out from a snow cave, as if we were the only two people alive. A deep snowfall has a way of doing that, of muffling sound and isolating beings. Every window was curtained with branches caked in snow, and small openings revealed glimpses of a steely sky. Looking up, through the branches. Carefully, gingerly, we opened the door and stepped outside to make our first steps in snow, as if we were the first humans to set foot on a strange, alien world. 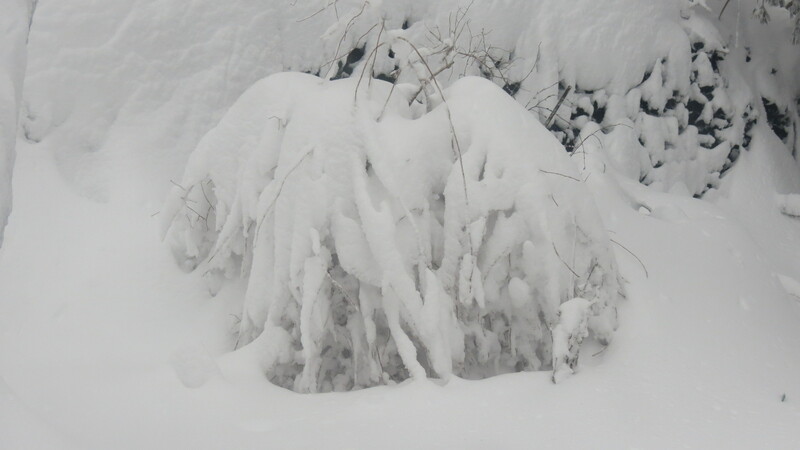 As I took these photos — some of which are of the same scenes from yesterday’s post — I was a bit overwhelmed at the snow’s brutal treatment of the plants. 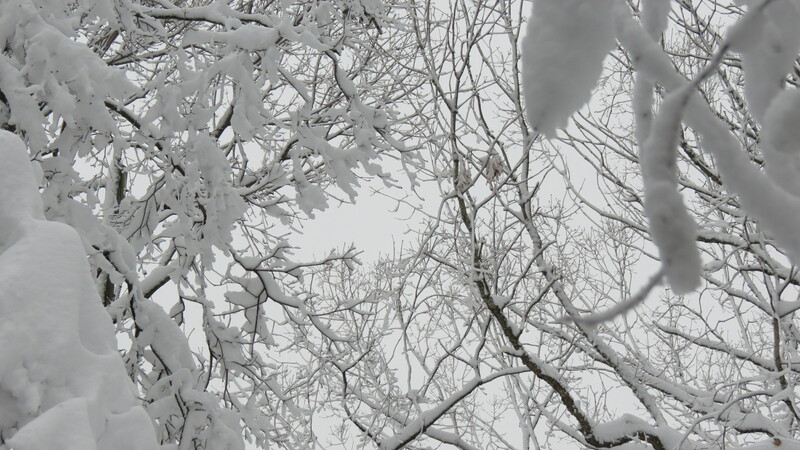 Yes, I thought to myself, this snow lost its prettiness about 24 inches ago. 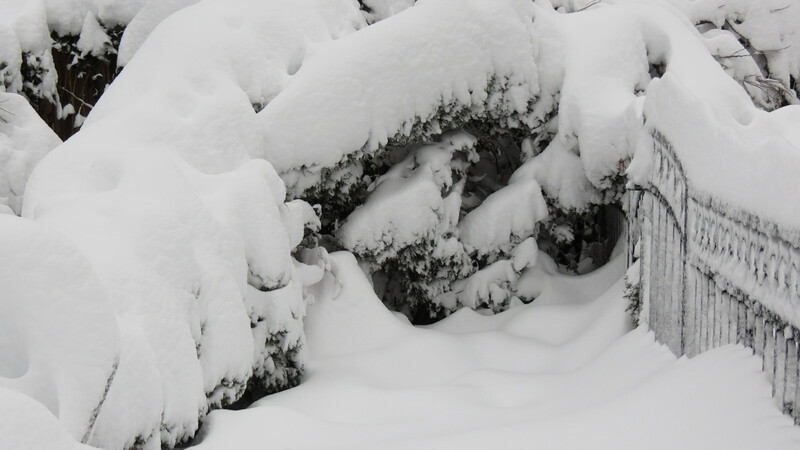 Ice cave or Weeping Dogwood? There are a lot of people who would say the same thing today. Not too far from my home, 150 cars on a major roadway became stuck in the blowing and rapidly accumulating snow. Some motorists opted to spend the night in their cars, while others simply walked away into the snowy night, looking to find shelter and warmth in shopping centers or convenience stores. Plows are now trying to clear roads, but abandoned cars are blocking their way. We’ve had a preliminary plow, one that clears the center of the street but pushes the snow along the side of the road even higher. As a result, we are homebound until the plows return — and that means grilled cheese sandwiches for lunch and skirt steak goulash for dinner and a few more journeys outside to shake the greenery free of its icy grip. 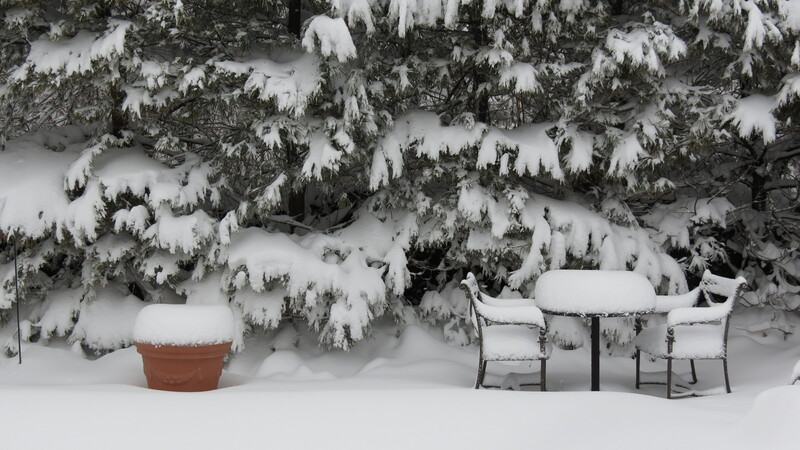 No outside dining today . . .
← Snow Falling On . . . Well . . . Everything! 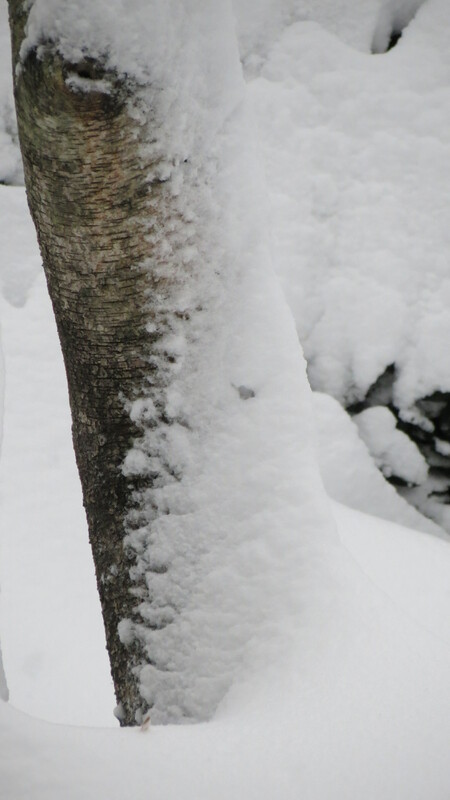 Kevin, this was indeed a cruel and brutal snow, forcing one of my tall birch trunks to bow low to Sovereign Snow. Early in the morning we cleared the spot where we feed the birds and a few have come around, poor things. Enjoy your skirt steak goulash tonight and look forward to Monday when the temps climb to the mid 40’s! Hello there. I’m a little worried about the warmer weather because it means rain — and with all this snow and frozen ground, it could also mean flooding. I do hope the rain will wash the snow and ice off of the trees and shrubs. I’m afraid I’ve lost a lot. We shall see. Oh WOW! It is beautiful to look at Kevin but what a mess of it. You two take care. Hi Lona. 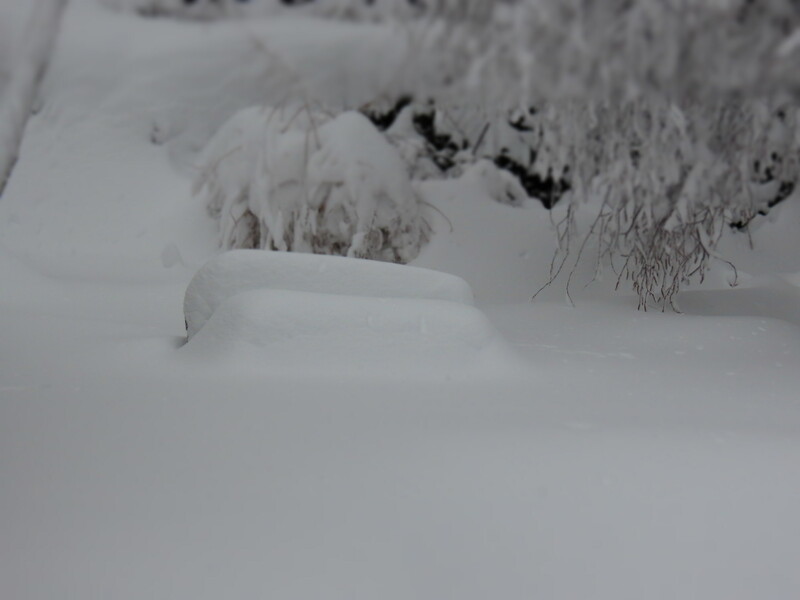 Snow is one thing — but the weight of this snowfall and the speed at which it fell is overwhelming. 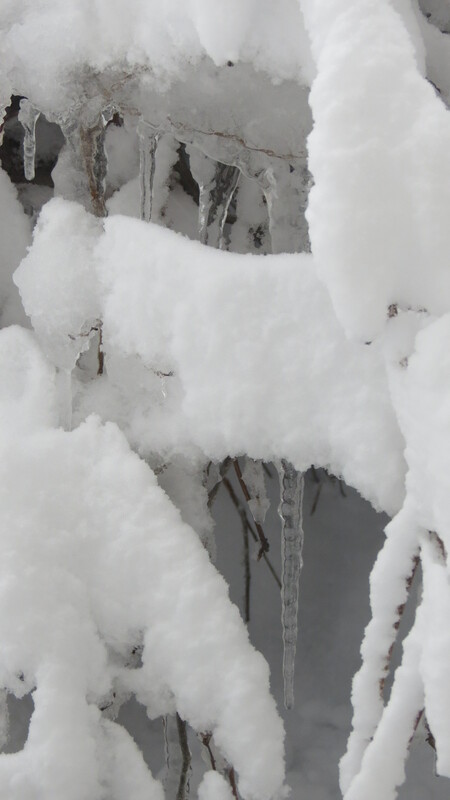 I tried to shake off some of the shrubs, but everything on the branches is frozen. I’ll just have to be patient for a thaw. Excellent photos! They do a great job of showing how deep it is. Having spent my first 40 years in Minnesota, I’m having trouble looking at that arborvitae – I want to rush outside with a broom. I believe they sort of stay bent over if you don’t get that snow off right away. Better put on the Sorels, Kev, and get whacking! So, do you think those giant marshmallows in your driveway might be cars? All I can say is OY. Living in Washington State, we’ve seen many a storm like the one pictured. Indeed magical as it falls, a nightmare the day after. I hope you don’t lose any trees. They take the brunt of the heavy ice and snow and around here, the tall ponderosa pine branches litter the roads after a storm, making driving impossible. Then there are the berms created by the snowplows, which block the driveways and keep us housebound. Good times!!! Stay warm, well fed, and safe until the melt. Thanks for your blog. I think you’re doing the right thing, not being too aggressive in clearing branches. As you say, some warm days will soften the snow that is iced in place, making it easier to sweep, brush or shake off. If damage was done because of the weight of the snow, it is already done. Good luck! Thanks for the vote of confidence, Cindy. 🙂 Once I can actually see what’s damaged, then I’ll know what my spring will be. Pruning? Relandscaping? Oh, the possibilities! stay warm! 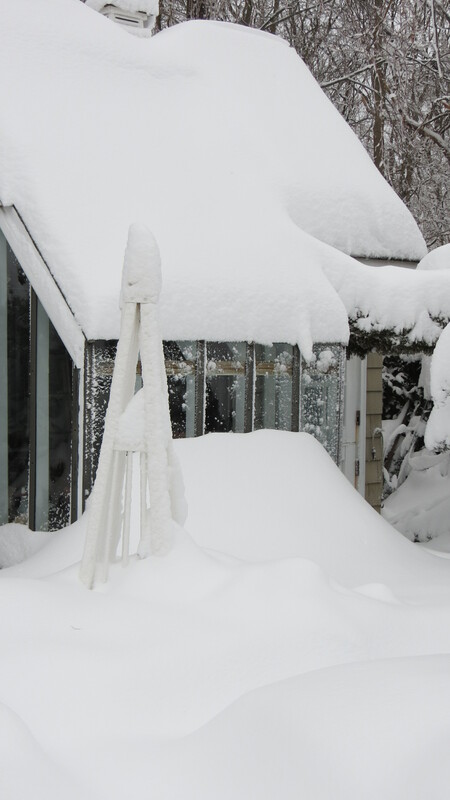 That is indeed a lot of snow…hope you are stocked up in the fridge! Hi Marguerite. 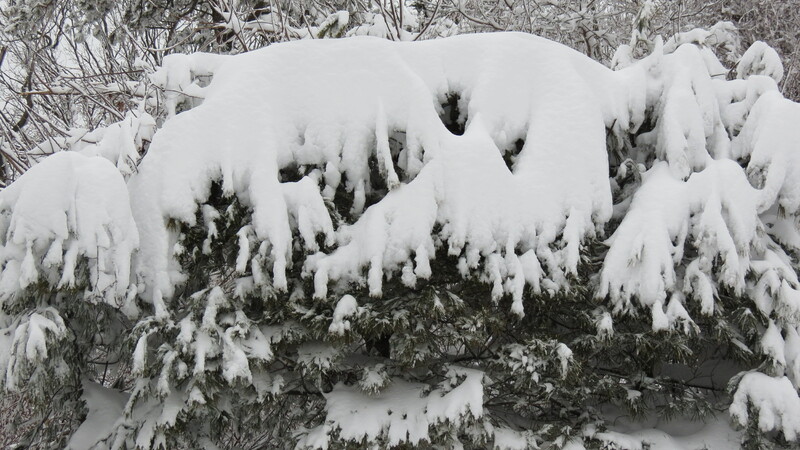 I’m trying to knock off some of the snow, but it’s frozen around the branches and evergreen foliage. It’s supposed to be in the 40s on Monday and heavy rain. Ugh! 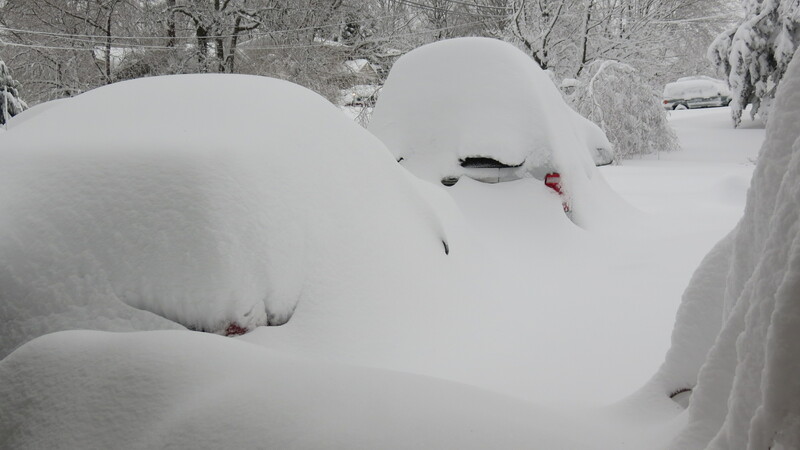 Hi, Kev – Loving your snow pics. It is beautiful to look at, but can be so damaging. I hope you don’t have too many losses in your beautiful garden. I imagine you will have a few days off from work, since the roads are impassable. Enjoy the unexpected vacation! Keep safe! Hello! I’m no sure how much of a vacation I’ll be getting — but I do want the winter to pass a little more quickly so I can see which plants survived and which didn’t. Brrr! I know. I know. But rain is coming next! Do I hear locusts on the horizon? Hi Rob. A foam party would have been much more fun — and easier to clean up! Hi Kevin, Well, it looks like a garden party is out of the question. Your “Blunderland” is beautiful from here, but I’m sure you’re tired of it by now. I hope you have plenty of supplies in the pantry. Wishing you a quick thaw! 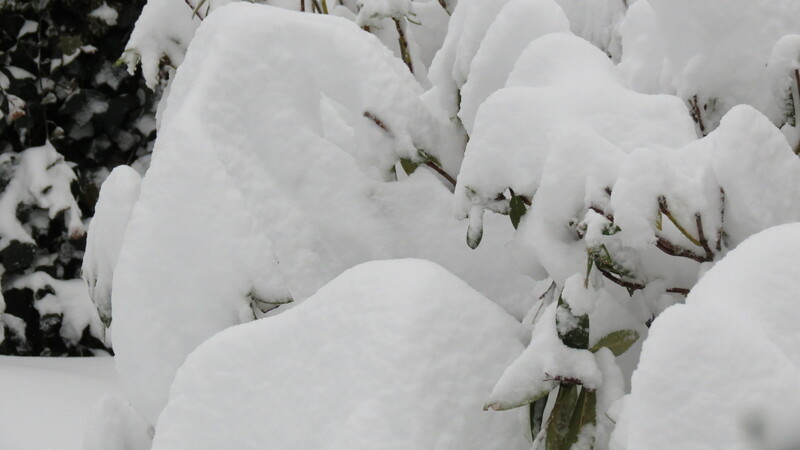 I spent the weekend circling plants in gardening catalogs while watching the white stuff accumulate. There was something surreal about looking at all of that snow outside the window and then looking down at the catalog to see all of the bold, beautiful plants showing off their colors. Hi Lori. I know the feeling. I’m doing the same thing. And speaking of color — have you noticed the brilliant blue sky? I’m not sure if the white snow makes it seem bluer, but that shade is incredible. Stay warm and safe. It is awful. It looks like devastation, to me and I’m certain it feels that way to your poor birch. This is surely the reason it is called “White Death”. Why do we live in the North, again? Hi Sissy. I think the birch will bounce back, but the arborvitae might not be so fortunate. I have to wait for the snow to be all gone to ruly see what’s salvageable. Ha ha! If I had to choose snow, I really like the powdery stuff. This snow was pure evil — and it’s lingering. The forecasted mild temps for the upcoming week should make a dent, though. Kat, thanks for the laugh! Yikes! Be on the lookout for plagues, frogs falling from the sky and the rivers running red! Also, if Charlton Heston shows up wearing a robe and making demands, just give him what he wants! I grew up in Minnesota so I know snow, but this is truly amazing. Thank you for sharing. Hello Charlie, and thanks for stopping by. The amazing part has been the slow response from municipalities to plow and clean so we can get back to normal. I appreciate your comment. Be well! Hola from Spain Kev and Joe! Kev, these pictures are incredible and really help me see what is happening at home. I must admit I am not missing the shoveling, the driving or the cold. Much more fun relaxing in the warm sunshine of southern Spain. I’ll try to bring some of the warmer temperatures home to you at the end of the month. Until then, hang in there with the cleanup. Love to you both!! Jeannie! I couldn’t be happier for your life in warm, sunny Spain — unless it was me! 🙂 Enjoy the rest of your time here — and please, please, please bring back some Mediterranean warmth. All I can say is wow!! This year I didn’t even have to shovel let alone snow blow. Hope things return to normal for you soon. Hi Flavian. 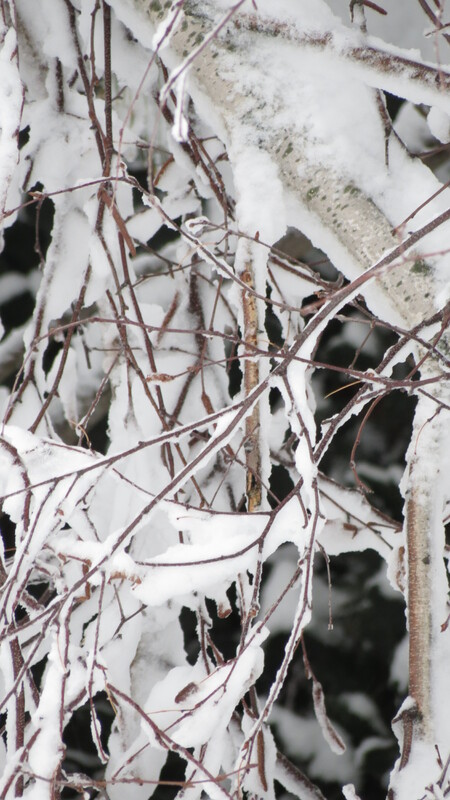 As the snow melts, I do see snapped branches. Spring will mean pruning and staking and, sadly, some removing. Hope you get some rain!